Laura Weise is a rather obscure figure, but whale.to features an extensive collection of her work. Her own website, complete with a large collection of her aura photos of herself, is here. Weise is an etheric warrior, which is apparently one who employs orgone energy in her or his battle against imaginary enemies and voices in her head. There is no winning those battles, one suspects, but Weise offers you plenty of advice and products that, if used without inhibition, will very likely boost your chances of getting the help you obviously need if you are engaged in this kind of combat. Especially if you heed Weise’s implicit warning and watch out forthe people who are following you – if you develop your abilities you will apparently be followed; Weise has experienced that they have sent helicopters to hover over their house. (Fortunately Weise can counter their attempts with her psychic powers). 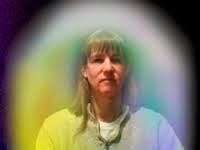 On her website, Weise offers Energy Coaching (“[g]et your energy system aligned and your aura cleared. Learn how to protect yourself from attack and neutralize your attackers. Credit card payment available”), Energy Bracelets (“[g]emstone bracelets for sale, our etheric helpers in the crystal world”), Cards of Destiny Readings (“[f]ind out what’s in store for you for the next year, and learn more about your personality and relationships”), Etheric Exercises (“[w]ays of practicing and basic tools for etheric health. Everything from grounding to working with cetaceans and higher dimensions,” some of which includes working with pyramids and triangles to boost your psychic abilities), Boosting (“[l]earn how to send love energy, basic to advanced,” including the new feature “13D Holographic Heart Boosting”) and Using Crystals. All the techniques are apparently helpful in countering psychic attacks, which tells you more about the nature of those “attacks” than Weise cares to admit. As for the 13D thing, apparently Laura has “been boosting from the 13th dimension for several years now.” Apparently the thirteenth dimension “is where the cetaceans hang out.” However, to “begin the 13D HH boosting, you first have to raise your awareness to the 13th dimension. Once you have done that, you boost in the normal manner, through your heart chakra.” So it requires some practice. Weise learned it from “a combination of Lemurians, Atlanteans and dolphins.” (She recounts here dolphin interactions here; “Carol” is Carol Croft. Diagnosis: Probably very, very harmless. NRO Wingnut Kevin D. Williamson, a further example of the the decline of Buckley's magazine.